When Zoe Walker sees her photo in the classifieds section of a London newspaper, she is determined to find out why it's there. There's no explanation, no website: just a grainy image and a phone number. She takes it home to her family, who are convinced it's just someone who looks like Zoe. But the next day the advert shows a photo of a different woman, and another the day after that. Is it a mistake? A coincidence? Or is someone keeping track of every move they make . .
"Routine is comforting to you. It’s familiar, reassuring. Routine makes you feel safe. I Let You Go was so freaking amazing that I knew I wanted to read Clare's next book. I couldn't wait to get my hands on it! The beginning felt a little slow for me but after that 10% mark, the pages pretty much just flipped by themselves. I was on a quest to learn every detail about the mastermind behind this horrible website. I wasn't sure why the women were chosen, I just wanted to stop it before more were harmed. I liked how the author gave us glimpses into the deranged mind of the person behind it all. Each time I felt scared as to what could happen next. "I see you. But you don’t see me." It all starts with Zoe Walker finding her picture in the classified sections of a newspaper advertising call girls while she is on the Tube. She's sure the picture is her but when she gets home, her family thinks it might not be. She lives with her two grown children Katie and Justin and her boyfriend Simon. She becomes more afraid when she recognizes another woman's picture from the same newspaper who's robbed a few days later. She immediately contacts the police. This is the first time she interacts with PC Kelly Swift. Kelly was part of British Transport Police’s Sexual Offences Unit but after doing something wrong at work, she was transferred to the BTP (British Transport Police) department She is very interested in trying to help women who have been raped. Her police instinct is telling her that Zoe is right and someone is targeting women by finding out their commute. She later is able to participate in the active search and works with DI Nick Rampello under his MIT team (Murder Investigation Teams). After finishing reading it, I'm sad I won't see more of Kelly and Nick. I thought they created a great team. He had her back and he recognized how smart she was. I wish this could turn into a series. I liked Zoe too. She was smart and she knew she was in trouble, alerting the authorities of what was happening. She connected the dots and knew she might be next. 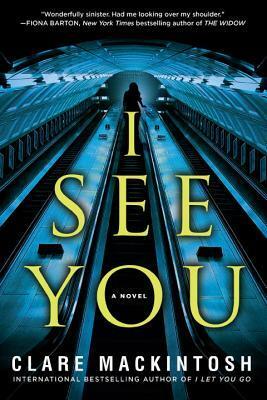 I See You it's a great thriller which makes you think twice about who's watching you when you don't know. Who's snapping a picture when you are not looking. "You do the same thing every day. I wonder what Mrs. Mackintosh would bring us next. A complimentary copy was provided by Berkley via Netgalley in exchange for an honest review.